My son doesn’t really understand holidays, but he enjoys their trappings, Christmas carols and Easter egg hunts. Halloween is his favorite, with its pumpkins, candy, and monsters especially. When my son was younger we read him books about poky little puppies, and very shy kittens, and donkeys with magic pebbles. But his favorites were those about monsters. We went through two copies of The Story of Growl, My Monster Mama Loves Me So was in heavy rotation for a while, and, like most children, he is an enthusiast of The Monster at the End of This Book. And his fandom transcends the literary. His “monster blanket” — a quilt with a mosaic of smiling creatures — is one of his few material possessions to which he has a strong attachment. He enjoys playing Go Away Monster! 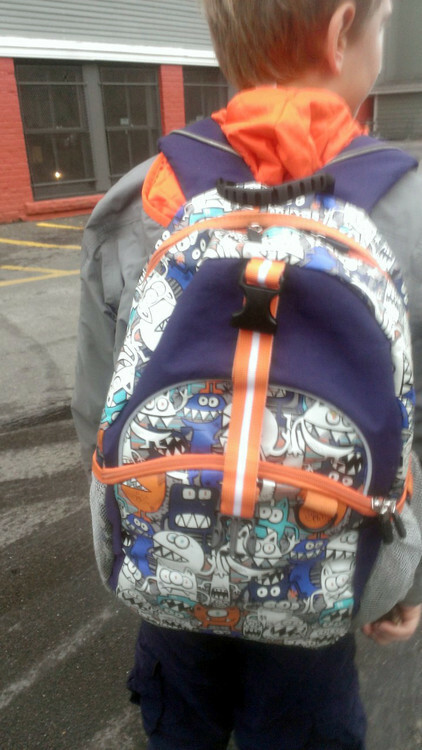 He has monsters on his posters and on his backpack. One year for Halloween we even dressed him as Max from Where The Wild Things Are, a role he was seemingly born to play. The roles that monsters and clowns play in childhood seem to have transposed in recent decades (since the advent of Elmo and Stephen King’s It, I reckon). 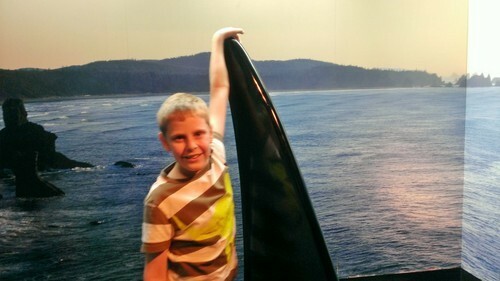 Even so, my son’s affinity for former seems greater than most. He certainly shows no fear of them. In fact, he is overtly frightened of little. He was so fearless about heights when younger that we wondered if he truly understood the danger that they posed, and I was reluctant to let him ascend to the top of the huge climbing structure in our local playground. One day I relented, though, and allowed him to climb to the top while I flitted about directly below, ready to break his fall should he slip. In the end it became clear that he is as attuned to the perils of heights as any other kid, and that my fear had been unnecessary. He is also bereft of social fear, for want of a better phrase. He doesn’t worry about fitting in, or if he has too few friends, or if he lacks the cool new status symbol. He seems unconcerned with how others view him, or how they might treat him. I don’t know if he understands the concept of the future, but, if so, it does not weigh on his mind. But here again my wife and I scurry around, fearing on his behalf. We arrange play dates with his classmates so that he has friends. We fret about teasing and bullying. We worry that, if someone were to hurt him, he wouldn’t think (or know how) to tell someone. In this respect we are no different that the parents of neurotypical children, concerned as they are with these very same things. But when it comes to the future, we have a fear that is specific to a special needs child: we don’t know what will happen to him when we are gone. Despite the early intervention and intensive therapy, it seems unlikely to me that he will ever be able to live independently, nor will he have a partner of any sort. (But, again, I no longer make predictions.) Where then will he live? And who will serve as his caregiver? The life expectancy of people with autism is more or less average. 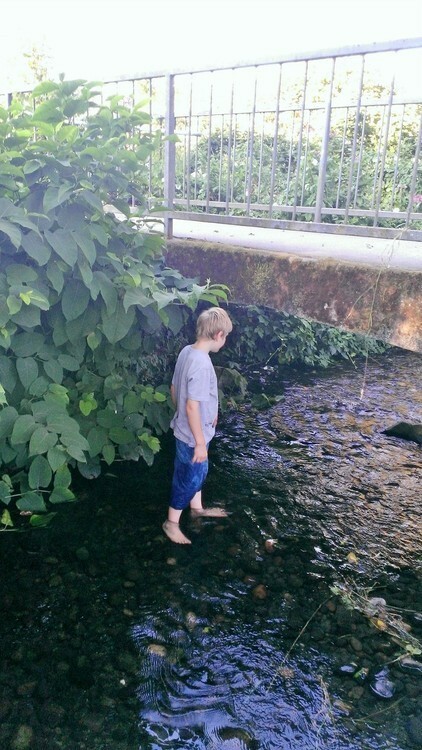 Here is another truth, then, about children with autism: they can’t stay at home forever. This realization — as obvious as it is worrying — has recently stirred the beginnings of a response from researchers, architects and, not least, parents. In 2009, a pair of academics, Kim Steele and Sherry Ahrentzen, collaborated on “Advancing Full Spectrum Housing,” a comprehensive design guideline for housing adults with autism…. Knowing that there are others out there who struggle with these issues, and who are working to build an infrastructure to address them, brings me great comfort. But I am not without some sleepless nights. When the door to the first home opened I prompted him with “what do you say?”, and he replied with a hearty “thank you!” He was handed a Milky Way, which he promptly unwrapped and ate, returning the wrapper to the bowl of the homeowner. He got the hang of things after a few houses, although “thank you!” remained his go-to line. We visited our immediate neighbors, all of whom have become familiar with our son since the elopement, and assumed that would be sufficient. 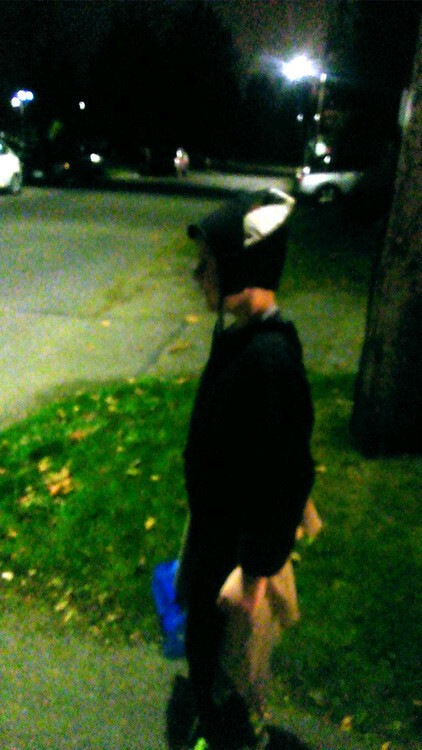 But when I asked if he was done, he said “more Trick or Treating”, and we continued around the block. A banner year, to be sure. His first words, when we returned to the house, were “bat off,” a fairly sophisticated utterance in that it implied awareness of his costume’s motif. We stripped him down to his PJs and let him partake in some Skittles before putting him to bed. When I checked on him several hours later he remained wide awake, still excited about the evening’s activities. I occasionally worry about the future, but spend most of my time enjoying the present. 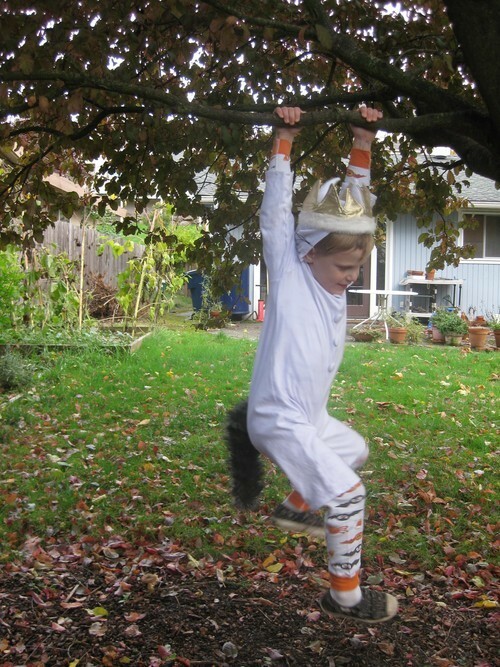 Raising my son is a little like Halloween: sometimes scary, but a whole lot of fun. 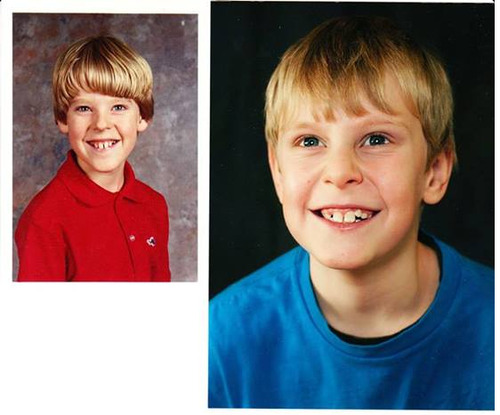 My son and I, both at the age of nine. This was a common lament at the time my son was first diagnosed. The idea that autism was a spectrum had not yet entered the mainstream and, for most, Raymond Babbitt was the only media portrayal of a person with autism to which they had been exposed. Thus, after revealing the autism in conversation, the parent of a child with Asperger’s or PDD-NOS would hastily clarify the scope and severity of their child’s impairment. In the eight years since then the particulars of ASD have become widely known; if you state that your child has “Asperger’s”, for instance, most folks know what you mean without requiring further details. (PDD-NOS, however, remains a mystery to most). Indeed, these days if you describe your child as autistic, many listeners first think of the many contemporary characters in media that are on the spectrum. In 2009 I wrote Autistic Trekdom, arguing that the character of Spock in the new films, coupled with Star Trek’s underlying message of inclusion, was a veritable celebration of neurodiversity out there. Shortly thereafter I was a guest on my local NPR station, where I spoke of the raft of new portrayals of people with autism, including Abed from Community, one of the children on Parenthood, and Max Jerry Horowitz in Mary and Max. To that list we can now add Gary Bell from the television show Alphas. While a rather generic superhero ensemble show, Alphas treats Gary with a lot of respect, and the character is actually one of the most complex and well-rounded on the program. All of the protagonists have struggles— with anger management, alcoholism, intimacy, and so forth — and those of Gary are not depicted as any more or less debilitating or noble. Better still, his colleagues often find him irritating and exasperating, just as they do each other. He is viewed as a unique member of the team, but also as just another co-worker. Given all this, people no longer instinctively hearken back to Rain Manwhen told that a child has autism. But for those of us with children on the lower-end of the spectrum, the pendulum has swung the other way. Now, if you simply describe your kid as having ASD, people are less likely to think of Raymond Babbitt than of Sheldon Lee Cooper from The Big Bang Theory. As one friend confessed to me, he has now come to equate ASD with “quirky”. 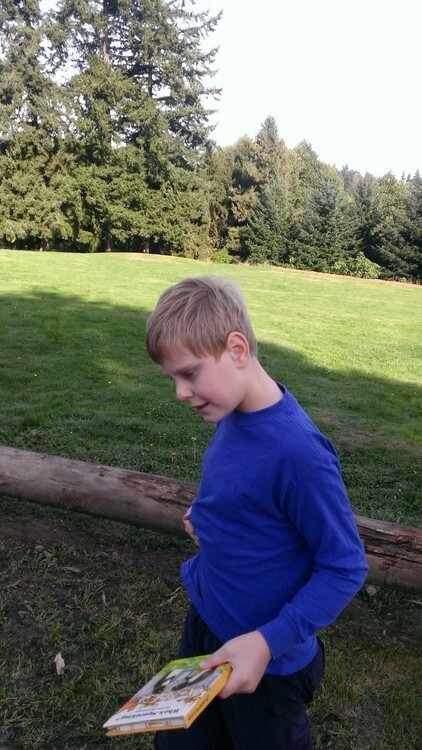 This is why, as you may have noticed, I usually bill my son as having “classic autism” rather than ASD, and am quick to add that he’s non-verbal. Even then a lot of my friends and acquaintances don’t really grasp the degree to which he is impacted, unless they meet him in person. I love the numerous and nuanced portrayals of people with autism in the media these days, but sometimes think that describing my son’s disorder would be easier if Rain Man were still the starting point for the discussion. Even as these contemporary characters with autism have become increasingly well-known, one element of Rain Man still lingers in the mind of many: savantism. For the record, savant syndrome is rare, even among those with autism (1 in 10 is the estimate of this study). My son takes piano lessons, but has no special skill in music; he uses fingers and a calculator to help in math; and if he’s able to calculate the day of the week of any given date, that’s news to us. His favorite thing to do with the Go set I bought when he was about four was to drop the stones down the heating vent and listen to them ping their way down the duct. Someday autism may be so well represented in the media that no particular character leaps to mind when it is mentioned, just as no one instinctively thinks of Blossom when someone mentions having a neurotypical daughter. Until then, Rain Man and Gary Bell will have to do. Jenny McCarthy is known for a few things, but when it comes to autism her primary claim to fame is that of an anti-vaccine crusader. If you read the section entitled “Autism activism” on her Wikipedia page, for instance, you’ll notice that her (scientifically unsupported) claims of a link between vaccines and autism make up the bulk of the material. McCarthy’s view on vaccines stirs ‘View’ controversy was a typical article about her recent foray into daytime talk. And whenever there’s a measles outbreak her name is sure to come up. But vaccines were not the sole focus of her autism commentary. And another aspect of her campaign — the “recovery movement” — is equally pernicious, at least for those of us raising children with ASD. The message is simple: children can recover from autism, and it is the duty of the parents (the Warrior Mothers, specifically) to do everything they can to reach this goal. As incentive, McCarthy and others in the movement (e.g. 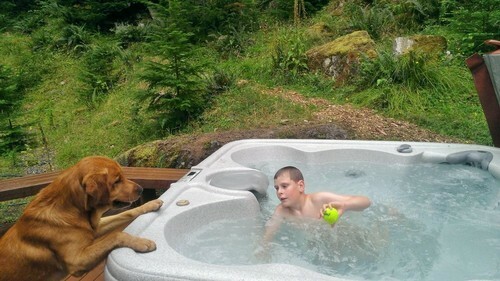 Generation Rescue and the Autism Research Institute) provide a seemingly endless stream of stories about kids who, through the tireless efforts of their caretakers, recovered, partially or in whole, from the disorder. The lives of these children improved, we are told, because their parents never gave up on them. I’ve spoken before of the central dilemma in treating autism: because every case is unique, there really isn’t a control group against which to compare the progress of your own child. Even so, many of these recovery stories assert causation: because development Y happened after treatment X was introduced, X led to Y; conversely, if X hadn’t been tried, Y would have never happened. Parents are urged to adopt these treatments themselves. If there is a positive development after you do so, that just proves its efficacy; if not … well, then, you just haven’t found the right treatment yet. But keep looking. Never give up. But the “inspirational” message of the recovery movement — that your child can recover from autism if you try hard enough — has a sinister inverse: it implies that if your child has not recovered from autism, it’s because you did not try hard enough, that you fell short in your role as a Warrior Mother, that “the way” remains somewhere out there but you were just too benighted to find it. What Solomon refers to as the “literature of miracles” puts many parents on a treadmill of trying every possible intervention—even if it’s not scientifically proven, even if it bankrupts the family. And how many times have you heard an “inspirational” anecdote about someone taking their first steps after being told he would never walk again? The anonymous doctor who “gave up” on the patient is cast as the bad guy in these stories, a fool and, worse, a roadblock on the road to recovery. A real hero, we can assume, would have ignored the evidence and given their patient that great gift of hope, assuring him that he will one day walk again if only he tries hard enough. Better that the patient blame himself if that doesn’t come to pass, I guess, than risk becoming the villain in some future inspirational anecdote. McCarthy and others in the movement seem to define “hope” as an antonym for “acceptance”. Maybe there’s some truth to that — hope mademy own journey to acceptance more serpentine. But acceptance isn’t a surrender, nor does it prevent a parent from doing all he can to help his child, to ensure that he gains as many life skills as possible. Acceptance is the recognition that autism is an integral part of this person you love, not some invading force against which you must march to war. Believe it or not I sympathize with Jenny McCarthy, as only one who is also the parent of a special needs child can. I think she is profoundly misguided on her anti-vaccine stance, and believe that her Warrior Mothers rhetoric can be as toxic as it is inspirational, but I assume these are things she sincerely believes and feels compelled to share. The anti-vaccine crusade in particular can be very seductive when your child has been diagnosed, as it offers both an explanation (MMRs) and an enemy to rail again (multinational pharmaceutical companies) at a time when you are longing for both. I don’t begrudge anyone buying into it. But I no longer wish to be “inspired” when it comes to my son, to be told that a recovery is all but inevitable. As Reinhold Niebuhr observed, you need more than just the courage to change the things you can; you also need the serenity to accept the things you cannot, and the the wisdom to know the difference. 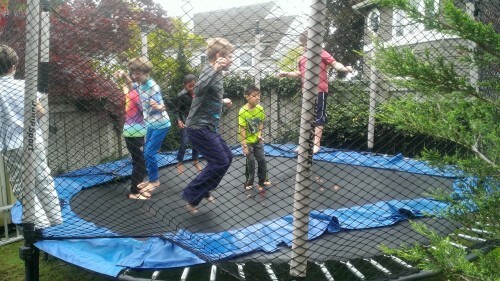 Birthday parties for kids with ASD are the best: trampolines, snacks, and little-to-no socializing. My son is exceedingly reluctant to try new foods, and introducing anything new into his diet requires a well-orchestrated campaign to have any chance of success. The first step is to simply place the whatever on his plate, alongside familiar foods, in the hopes that he will not realize that it is something new. This, to the best of my recollection, has succeeded exactly zero times. Stage two is “just eat a little bit”, in which I segregate some small portion of the whatever away from the main corpus, and cajole him into eating that. This works infrequently. Next, I cut off a similar-sized piece for myself and make a grand show of eating it; unlike when he was younger he seems to get this now, and on rare occasions will follow suit. If none of this works, I resort to bald trickery. My son rarely sits while eating, instead pacing around the dining area while scripting. I wait for him to draw near and then nonchalantly hand him the “little bit” that I cut of earlier. More often than you might imagine he unthinkingly pops the food into his mouth, so engrossed is he in his activity. My last-ditch gambit is to encourage him to at least sample the flavor. “Taste it with your tongue,” I say, and he will do so if in an especially trusting mood, giving the food the tiniest of licks and then evaluating its palatability. This morning I fried ham for his breakfast and, as it was new, went through the entire ritual above. “It’s Canadian bacon,” I emphasized several times, but he is unfortunately immune to marketing. He wouldn’t try the little bit, paid no mind when I ate some myself, and returned the piece I handed him to his plate before continuing on his way. “Just taste it with you tongue,” I finally pleaded, gaving him the sliver of ham. To my surprise he obligingly brought it to his mouth. I was certain of victory, once he realized that it was essentially bacon. But he did not taste it. Instead, keeping his eyes on me, he surreptitiously licked the ball of his own thumb, and then returned the ham to the plate as if he had tried and rejected it. I guess I should of been mad at the deception. But I’d never seen that before, and hey: lying is a social skill. Go, theory of mind! 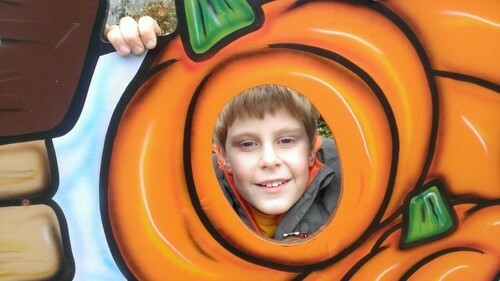 Every year in late October my son’s school takes a field trip to a local “pumpkin patch and family fun park”. For the last two years, I have gone as well. Many parents join the expedition as chaperones or drivers, but I am there specifically to ensure that my son does not have an “episode”. Three years ago, before I began attending, there was an incident. At some point during the train ride my son became unaccountably agitated, and behaved aggressively toward the aide who was accompanying him, biting her on the arm. Afterward he had to be isolated from the other children while they calmed him down. We weren’t surprised when we heard the news. There had been several similar incidents before then, and the field trip itself was a minefield of triggers. 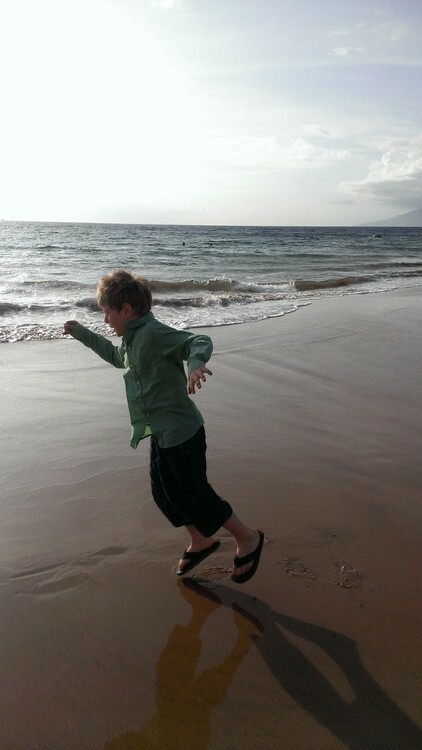 It was a full day of unstructured time, for instance, and my son fares best when there is routine. 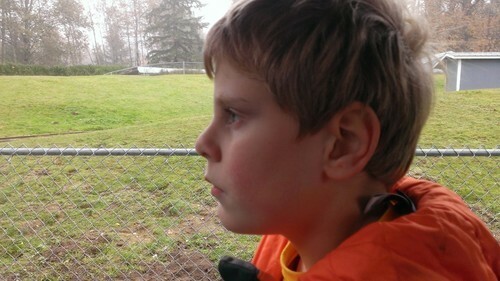 Riding the train was a novel experience, and it’s hard to tell in advance how he will react to such things. Perhaps most significantly, there was no way to exit the vehicle once he began to get agitated. Normally, when we or one of his teachers sense that he is becoming upset, we quickly intervene to separate him from the “antecedent”, as they say in ABA. In a situation like a train however, where there is no escape, there may also be no way to circumvent an outburst . That was a rough year for him, and he has since gotten much better. Still, the school asks that I accompany him on these trips, as a precaution. Because my son is largely non-verbal, he doesn’t tell us when he’s happy or sad or angry. We instead have to infer his internal state from his actions and demeanor. When happy he laughs, and displays boundless exuberance. He cries when sad – sometimes body-wracking sobs for reasons unknown to us. When he is angry he often lashes out, grabbing or pinching, and in extreme cases biting. Usually these are just fleeting moments of aggression, but occasionally he will fly into a rage, at which point it becomes exceedingly difficult to de-escalate the situation. This became such a problem that we genuinely worried that he would get kicked out of school. Our greatest fear was that he would behave aggressively toward another child. Fortunately, these episodes conformed to the general rule that he ignores all except those with whom he is most familiar. Thus, the targets of these attacks were usually his teacher, aides, and parents, and we have all learned strategies for defusing the situation. Over the last few years these incidents have become, on average, less frequent and severe. This is partly because he is maturing, I’m sure. But it’s also because we’ve become skilled at predicting what will disturb him, and steering clear of those circumstances. 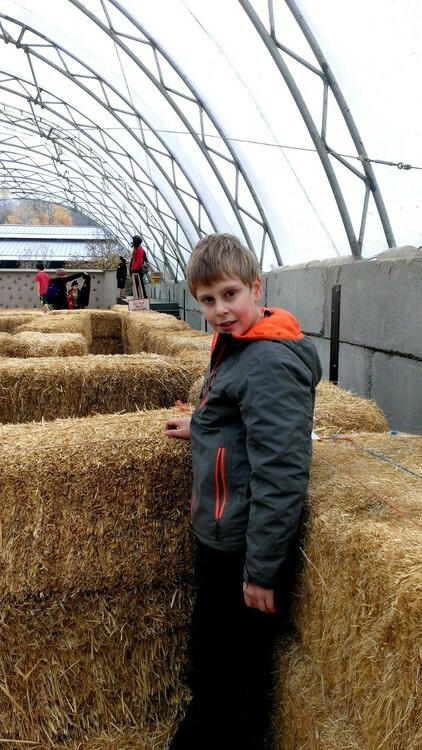 When we rode the train at the pumpkin patch today, for instance, I took a number of steps to minimize the chance that he would become upset. We waited until there wasn’t a line so we could board immediately, and wouldn’t find ourselves in the middle of a crowd. We sat by ourselves, at the front of a car. I held his hand to make sure he felt secure. And I watched him vigilantly out of the corner of my eye, for any sign of agitation. Whether because of these precautions, or due to factors beyond my ken, he remained calm for the entire ride, and asked to go again. I’ve always been something of an existentialist, believing that we can never truly know what’s in the mind of another. Others may tell us what they are purportedly thinking and feeling, but even then you can never really know if they are telling the truth, or if their perception of emotion is synonymous with your own. With my son, you don’t even get this. All you can do is look at the shadows on the cave wall and guess as to what are casting them. And even though we know our son better than anyone, we still cannot predict with anything resembling certainty how he will react to any given situation. His moods are as volatile and unpredictable as the weather. Our ability to forecast has improved over the years, but even we carry umbrellas. What is your son’s favorite game. I am a fan of board games, so folks often wonder what I play with my son. He doesn’t get the social aspects of play (competition, cooperation, trading, and so forth), nor the narrative arc of games like Max, but he enjoys the pattern-matching of picture dominoes and The Kids of Carcassonne, even if we don’t keep score. His favorite game, however, is the simple but engaging Animal Upon Animal. 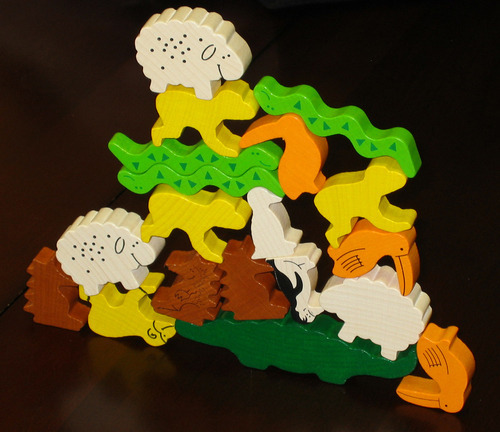 Animal Upon Animal comes with 29 chunky wood animals: a single crocodile, which starts the game in the center of the table, and four sets of seven different animals. Each animal has a distinct shape, with smooth curves (snakes), bumpy backs (sheep), pointy ridges (hedgehogs), and flat feet (penguins). On a turn you roll the six sided die, and perform the action indicated. In most cases this will involve taking one or more animals from your personal stash and placing them onto the ever-growing pyramid in the center of the table, but some of the die faces allow you to instead enlarge the base of the pile, or even give one of your animals to an opponent. 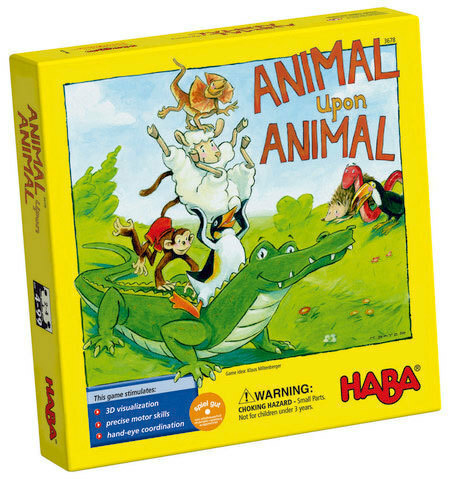 Any animals that topple to the table during your placement go back into your reserve, and the first player to get rid of all of his animals wins. The game is pure dexterity, and therefore perfectly suited for my son. Even better, his nimble little fingers make him a better player than I, and he has a knack for spotting clever placements, where the edge of one animal fits neatly into the groove of another. His only fatal flaw, in regards to strategy, is his preference for the snakes, even when another animal might be easier to place. But I have to admit the snakes are the cutest, and it is very satisfying to sneak one onto the top of a tall and precarious stack. I recommend Animal Upon Animal to all parents, not just those of children with autism. It’s one of of the few kid’s games that’s as fun for adults as it is for the intended audience. Just make sure all the pieces go back in the box after you are done — step on a hedgehog in the middle of the night and you will swear off board games, or children, forever.